This is my first photo tour detailing the bridges and structures of a great American river. In this survey, we visit the bridges, locks, and dams on the Mississippi River. We cover the entire river from its headwaters at Lake Itasca to the Head Of Passes where the river empties into the Gulf of Mexico. The Mississippi River is commonly divided into four sections. The northernmost section is the Mississippi Headwaters located in northern and central Minnesota. As the river meanders across Minnesota, it passes through three distinct geographic regions. The Lake Itasca to Ball Club region is an area where the river is hardly more than a trickle, and the main channel is often hard to find in vast wetland and lake areas. The Cohasset to Brainerd area is noted as an area where the river has low banks and a nearly infinite number of curves. The Little Falls to Monticello area is where the Mississippi River practices for the big time with larger flows, wider river crossings, and deeper river banks. One does not visit the headwaters area just to see bridges. Rather, the bridges are an excuse to draw a person into areas where they might otherwise never venture. Rather than being the destination, the bridges are a reason to visit some of the little known areas where the river grows up from being a small stream to being one of the greatest rivers on our small blue planet. The next section of the Mississippi River is the Twin Cities metro area. The river passes through the Twin Cities in a deep gorge that is now manged by the National Park Service as the Mississippi National River and Recreation Area. The river has been both a highway for water traffic as well as a barrier for land travel. The result are a number of impressive structures that facilitate boat and barge traffic, and a spectacular collection of impressive and historic bridges. The third section of the river is the Upper Mississippi River, which runs from the confluence with the Ohio River at Cairo, Illinois, up to the Twin Cities metro area. In this section of the Mississippi, we find the river often changing from being very wide and shallow to being very narrow and deep. This results in some bridges having very long causeways, up to 5 miles in length, with a relatively modest structure crossing the main channel. Other bridges have very impressive superstructures, or are of the ultra-modern cable-stay variety. It is amazing how many different solutions have been designed and built over the years to allow cars to drive from one side of the river to the other. For much of its length, the upper Mississippi River is not so much a river as it is a series of lakes backed up behind navigation structures. This makes the river into a giant stairway of water steps for boats and barges to climb or descend. The final section of the Great River is the Lower Mississippi River, which flows from the confluence with the Ohio River down through New Orleans and into the Gulf of Mexico. This section of the Mississippi carries the combined flow of the Wabash, Tennessee, and Cumberland Rivers via the inflow from the merger with the Ohio, was well as the Missouri and Illinois Rivers that merge in at Saint Louis. The lower Mississippi is very different from the upper river. The upper river has many islands, back channels, and back water areas. Crossing are often 5 miles wide. 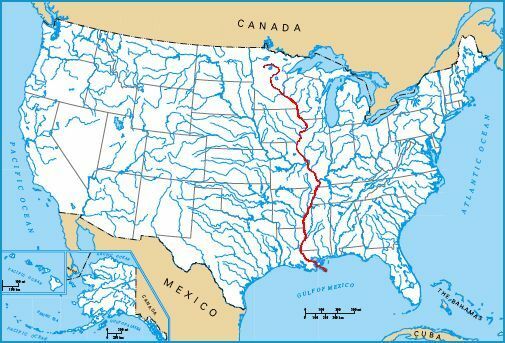 In contrast, the lower Mississippi runs in a single narrow deep channel at a relatively fast rate of flow. Through most of the lower region, the Mississippi gets deeper rather than getting wider. As a result, this is some of the deepest fresh water in the world, with the river bottom being below sea level up past Baton Rouge and into southern Mississippi. Unlike other installments of the Bridges and Structures series, I tried to capture every bridge that comes in contact with the Mississippi River. This includes park bridges, bridge ruins, and bridges crossing back channels. I only use my own photography, which is part of the trick of doing these Bridges and Structures web pages. One has to do the travel to seek out and find the bridges as well as doing the research on their history and writing the stories. I started this project with a mid-level pocket digital camera. While I was impressed with what this little camera could do, I often found myself limited compared to the typical results obtained with an SLR camera. As a result, I upgraded to a Minolta digital SLR, and I am reshooting many of these structures as time permits. Taking photos of these bridges can be surprisingly difficult. First, they are big. That means you have to get back quite a ways to capture the profile of a bridge. That allows plenty of room for things to get in the way, such as structures and trees. Second, most of these bridges are located in areas where it is hard to get a good line of sight. That might be because there are no secondary roads in the area, or the land is private and posted for no trespassing. Third, the main spans are usually inside of the levee systems, but in most cases, it is not legal to drive on or cross a levee. Finally, these bridges are busy, so you have to be very careful to avoid being in an accident or causing an accident. Bridges rarely have pull-offs, viewing areas, or even places to legally stop to take a photo.